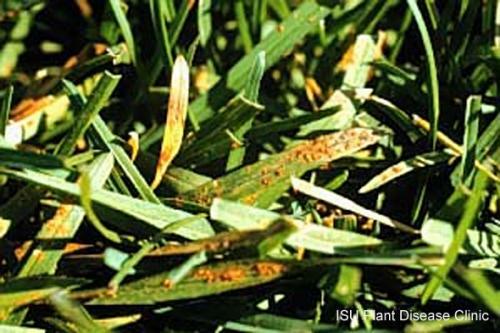 Turfgrass rust is a fungal disease that causes lawns to appear yellow or orange when viewed from a distance. The rust fungus produces powdery orange spores that are easily transferred from leaf blades to shoes, pant legs or mowers. Rust tends to show up midsummer, especially when grass growth has been slowed by stresses such as drought, low fertility, close mowing or compaction. The rust fungus thrives when temperatures are moderate (68 to 85 degrees F) and leaves stay wet for extended periods. Long dew periods or night watering can create moisture conditions ideal for infection. Initially, diseased plants show yellow spots on the leaves. With time, these spots enlarge and the fungus breaks through the outer leaf surface. By the time the powdery orange spores of the fungus are exposed, it's obvious how "rust" got its name. We can't change the weather to defeat rust. However, it is easy to change cultural practices that may predispose turf to rust. Keeping plants in good health also will help discourage visitation by numerous other unfriendly fungi that cause problems on turf. Mowing. Avoid close mowing. Mowing below recommended heights depletes the grass of energy reserves, thins the lawn's canopy and encourages weeds. The best strategy is to mow frequently, but never remove more than one-third of the plant height. For example, during summer, bluegrass typically should be mowed at 3 to 3 1/2 inches. This means mowing when the grass reaches 4 1/2 inches in height. The rust fungus needs a living plant to survive. Regular mowing severs infected leaf tips from the plant, helping to reduce the amount of fungus present. Watering. Avoid night watering. This increases the length of time grass blades remain wet. Many fungi, including the rust fungi, need to be wet for a certain period of time to infect grass blades. Early morning or afternoon irrigation ensures that plants dry by evening. Also, avoid frequent light waterings. Light waterings discourage downward root growth, predisposing turf to injury during dry periods. Poor root health also allows root nibblers, such as the summer patch fungus, to gain entry into the grass plants. Soil fertility. Apply fertilizer according to soil test recommendations. When too much or too little fertilizer is applied, diseases can gain a foothold. Diseases such as rust and dollar spot tend to occur more on nutrient-deficient lawns than properly fertilized lawns. Excessive fertilization favors leaf growth at the expense of root growth, making the lawn susceptible to diseases such as summer patch, brown patch or Pythium blight. In general, spring and fall applications of a slow-release form of nitrogen are recommended. Thatch. Thatch is the layer of dead grass material on the soil surface of a lawn. A moderate thatch layer is beneficial, acting as a protective mulch layer. Ideally, this layer should be no more than 1/2 inch in thickness. The thatch depth can be checked by cutting several small sections out of the lawn and measuring the layer's thickness. When thatch becomes excessive, the roots of grass plants tend to grow in the thatch layer rather than in the soil. When the thatch layer dries out during a drought, the root system becomes stressed. Excessive thatch can be removed mechanically. Using a core aeration machine to remove soil cores also provides better movement of water, air and nutrients into the soil. Grass cultivars. Many grass cultivars possess resistance to certain diseases. It's a good idea to include one or more disease-resistant cultivars in a blend when seeding. Fungicides. Fungicides can control many of the common diseases such as rust. These products, however, cannot replace good cultural practices that reduce stress to lawns. Effectiveness depends on the correct diagnosis of the problem and proper timing of applications. Most products need to be applied before the disease shows up or at the very first signs of disease. It's sometimes difficult to determine whether fungicide sprays are warranted. Rust, for example, usually doesn't reach damaging levels before the grass begins winter dormancy. Fungicides are not routinely used. Adhering to good cultural practices is basic to reducing turf disease problems. Encouraging vigorous growing conditions helps plants to fend off problematic pathogens. Routine monitoring and scouting allow for early detection of any disease problems. The grass beneath one of my trees has turned brownish orange. Why? Large areas of my lawn have turned orange. Why?